Osaka, Japan - On April 20, 2016, Panasonic Corporation's autonomous delivery robot, HOSPI(R) received the first certification*1 under new JIS safety standards for personal care robots. 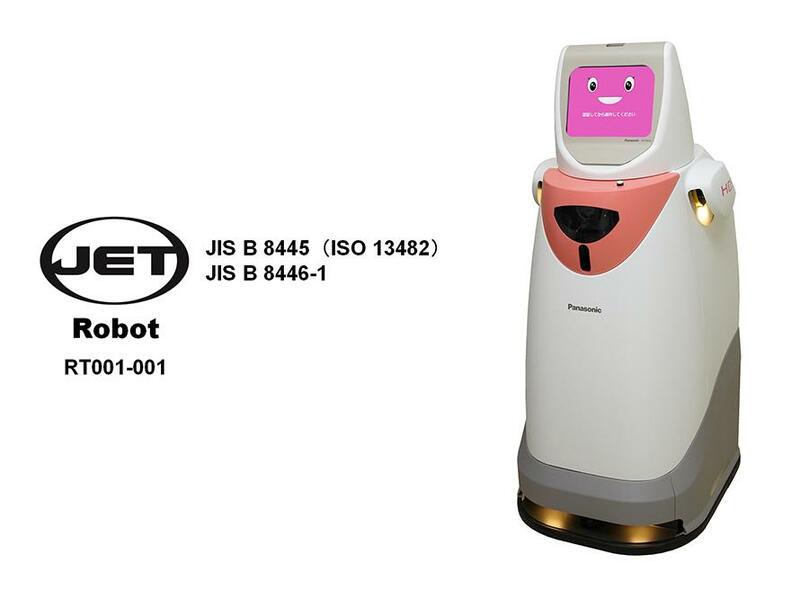 This certification has been issued by the Japan Electrical Safety & Environment Technology Laboratories in accordance to the new JIS standards, "JIS B 8445" and "JIS B 8446"*2 in recognition of the safety of Panasonic's autonomous delivery robot HOSPI(R). At the same time, Panasonic also obtained the international standard for personal care robots, "ISO 13482." Panasonic's "HOSPI(R)" can autonomously deliver items such as pharmaceuticals and specimens in hospitals on behalf of hospital staff. Because the robot can maneuver around based on pre-programmed maps and by recognizing the surrounding environment with sensors, it is no longer necessary to embed wires, sensors etc. into the walls and ceilings or to place electromagnetic tapes on corridors. Even if there is a change in destination or layout, such information can be updated easily and at low cost. Also equipped with high performance sensors and collision-avoidance algorithm, the robot can move about safely and efficiently without colliding into passersby or various objects along its route. The JIS certification Panasonic has recently obtained - "JIS B 8445: Robots and robotic devices - Safety requirements for personal care robots" and the "JIS B 8446-1: Safety requirements for personal care robots - Part 1: Static stable mobile servant robot with no manipulator" - are JIS safety standards for personal care robots issued on April 20, 2016. "JIS B 8445" is the Japanese translation of the International Standards Organization's "ISO 13482 Robots and robotic devices - Safety requirement for personal care robots." And "JIS B 8446" is comprised of 3 types of standards Japan has taken initiative to establish based on the ISO 13482. With the recent certification, not only has "HOSPI(R)" cleared the international safety standards applied to the structure and performance of robots, but it has also become the first robot in the world to satisfy different types of safety standards. With the cooperation of the Ministry of Economy, Trade and Industry as well as other national organizations and respective institutions, Panasonic has developed personal care robots, promoted the robotics business, and contributed to the formulation of safety standards. Panasonic will continue to work with other robotics institutions and manufacturers in Japan to propose and promote the "JIS B 8446" standard it has recently satisfied as a new ISO standard. Having obtained a third party safety standard for "HOSPI(R)," Panasonic will magnify its efforts to promote its personal care robots to help realize a safe and secure, convenient lifestyle with personal care robots. The Japan Electrical Safety & Environment Technology Laboratories (JET) is a general incorporated foundation that issues third party certification for electronic products, etc., and conducts testing, EMC measurements , surveys, and research. Established in February 1963 as the Japan Electrical Testing Laboratories of Japan Electric Association , the organization took over the safety testing operations from the National Institute of Advanced Industrial Science and Technology of the Ministry of International Trade and Industry and conducted type approval tests for electrical appliances. Following the relaxation of applicable regulations in July 1995, JET has been testing electrical appliances etc., conducting investigative research, and also has been testing and issuing certification based on Japanese Industrial Standards (JIS) as well as other standards. *1 According to Panasonic research as of April 21, 2016. *2 JIS B 8445/JIS B 8446 JIS safety standards for personal care robots issued on April 20, 2016. Panasonic Solutions Report 04 "Health Care Solution"
Too busy to catch up on our news? Here are the TOP 5 most engaged posts for FEBRUARY 2019.